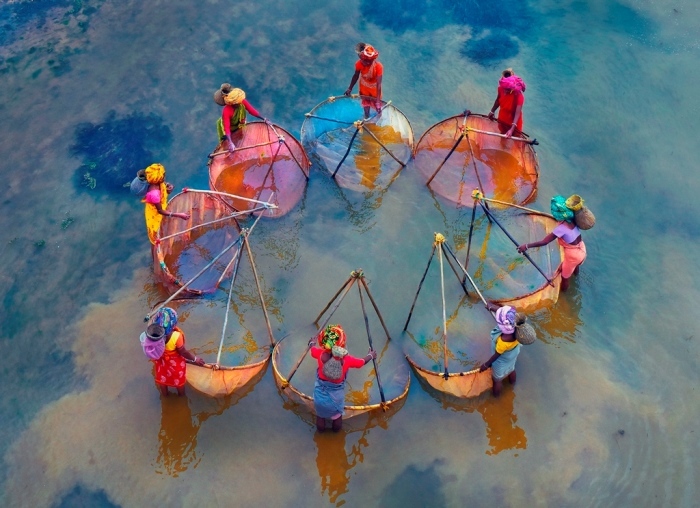 Congratulations to the winners of the 2019 WIN photo competition on water integrity and gender! We are again blown away by the incredible images we have received. Thank you to all those who participated and reflected on the role of women in the water sector and the importance of gender for water integrity thinking. Special thanks also to the judges for their support, time, and contributions. What we see in these stunning photos is women and girls at the forefront: women providing and managing water, women working and fighting for better water, for survival, for their livelihoods and that of their communities. We also see women exposed and vulnerable, and particularly so: to poor service, to water-borne diseases, to pollution, and to corruption in all its forms. 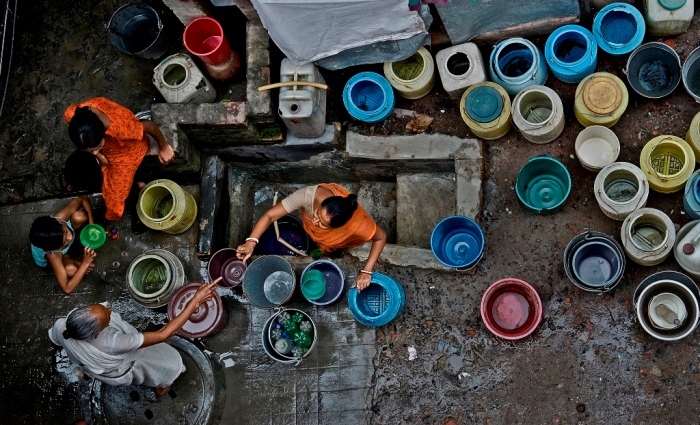 The photos here are in many ways typical of the water sector, with women front and centre. It is known that women are the main collectors and managers of water for households in most parts of the world. This is in sharp contrast with what we know is the reality of water sector decision-making processes. In 2014, women made up less than 17 percent of the WASH labour force in developing countries. Women were especially underrepresented in technical jobs, leadership, and policymaking jobs. It is similar in other water sub-sectors. Water integrity means ensuring resources and services go where they are intended – and most needed – so that water is fairly and sustainably managed. When resources and services are not benefiting the many who need it direly and when we see the women who are bearing the brunt of this poor service and limited access, we see a failure of integrity. This failure is all the more acute because these same women are rarely at the decision-making table. It’s important to look again at the images we see of women in water, to actually take note of the elephant in the room: water integrity is a woman’s issue. We need to strengthen our understanding of the gendered impacts of corruption and poor integrity. We need to publish gender disaggregated data. We need to urgently devise gender-responsive tools for integrity. 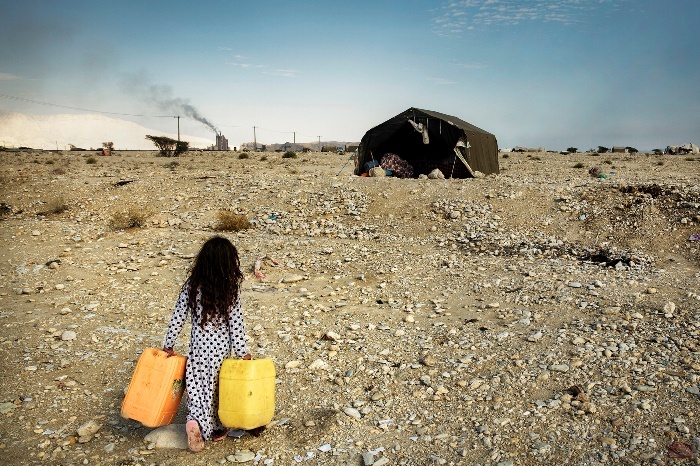 A girl from a nomadic tribe is carrying two gallons of water to her family’s tent. She is obligated to do this daily in order to provide for her family. They live in the shanty regions of cities and are generally excluded from access to primary services like water, electricity, heating as well as education. (Bandar Khamir, Iran). The Grass Cutter. 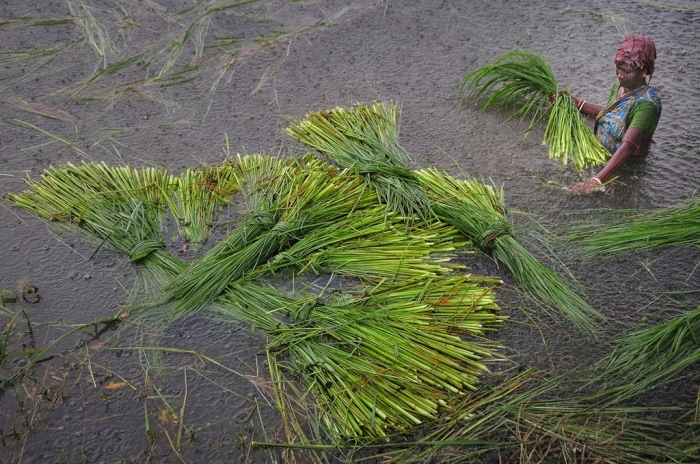 During the rains, in the low-lying areas by the Ganges, ropes are produced from long-leaved grasses, and used to tie paddy stacks, tend cows and for other domestic purposes. The plants are first cut and submerged. Once the leaves are rotten, the central vein is separated by hand and used as a long fibre to make natural ropes. This work is mostly done by women, submerged in polluted waters. Aside from being bitten by snakes and leeches, they are then vulnerable to water-borne diseases. Awareness campaigns for domestic sanitation have recently helped reduce the risk factors a bit, but women in rural areas remain particularly vulnerable. (India). Daily Drama. In recent years, the shrinking of glaciers in the Himalayas due to climate change has affected all the rivers in north India. Intensive groundwater exploitation has also deprived a great majority of the population, mostly underprivileged, of access to even drinking water. 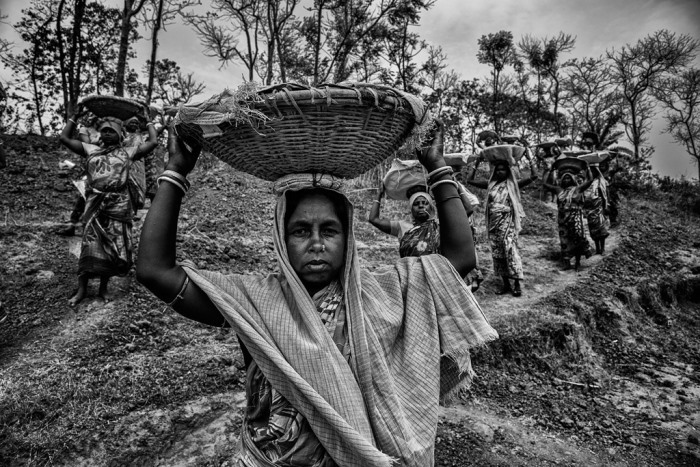 This image was shot at a slum at Salimpur in Kolkata. The tap in view, supplying ‘Corporation Water’ for a total of four hours a day, is the only source of water for the hundreds of families dwelling here. With so little supply and so many takers, fierce quarrels and fights are regular affairs. The older and the middle-aged women in the picture are engaged in a brawl, while the two young girls look on. Many buckets and vessels are queued up, waiting to be filled. When watching these women, one cannot resist feeling that these clashes may only become uglier and more frequent. (India). Solutions in Need. In arid districts of West Bengal, where water scarcity is a burning problem, local government bodies implementing a government water scheme, employ local women to dig up a pond to secure a water supply to villagers with water. The scheme contributes to empowering the women who receive daily wages. (India). 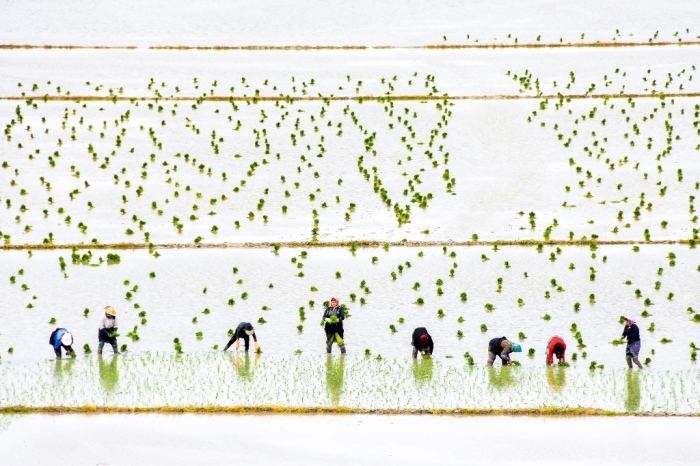 Women rice farmers. Roughly one third of Iran’s total surface area is suited for farmland, but because of poor soil and lack of adequate water distribution in many areas, most of it is not cultivated. Only 12 percent of the total land area is actually cultivated and less than one third of the cultivated area is irrigated; the rest is devoted to dryland farming. The western and north-western portions of the country have the most fertile soils. Iran’s food security index stands at around 96 percent. The toil of women rice farmers, provides food for our lives. (Iran). Demonstration for water. 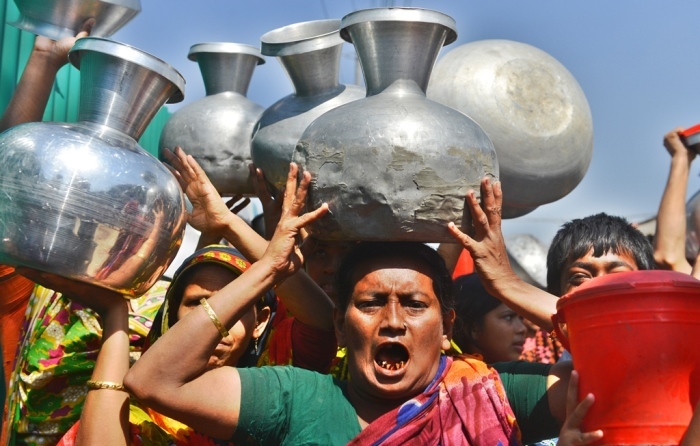 Holding pitchers upside down to symbolize water scarcity, residents of Dhaka demonstrate, blocking a portion of a road. The residents took to the streets for nearly an hour demanding water supply. The water crisis has become acute in many parts of the capital, making the lives of residents sheer misery. (Bangladesh). Sinking Sundarbans. September 20, 2017. 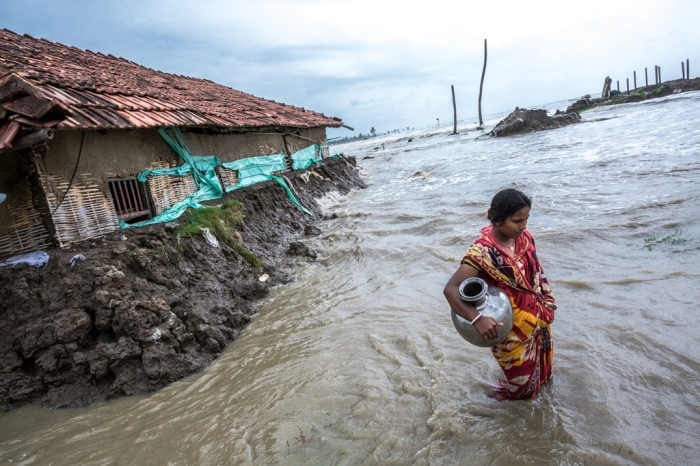 A woman is fetching drinking water, struggling against the tidal flood in Sagar Island, Sundarbans, India. The southern part of Ganges-Brahmaputra-Meghna delta is a common ground between India and Bangladesh. The Indian delta region stretches over roughly 4000 km². It is covered with the biggest mangrove forest in the world containing 102 swampy islands out of which only 52 are inhabited by humans. The people here largely depend on the natural resources of the area for their livelihood. Global warming is the prime threat to this delta region. It is resulting now in devastating floods, intense storms, torrential rains, and a rise in sea levels. Sundarbans is seeing a 3.14 mm rise in sea levels per year. As the rise in sea levels increases the water salinity, it degrades soil quality and further reduces crop yields. Drinking water is getting harder to come by with every passing day. As water gradually devours the islands, experts predict that in the next 50 years 25 percent of the land in the Sundarbans be devastated. (India). River bathing. In rural areas of dry zones in India, toilets and bathrooms are not useable because of a lack of water supply. 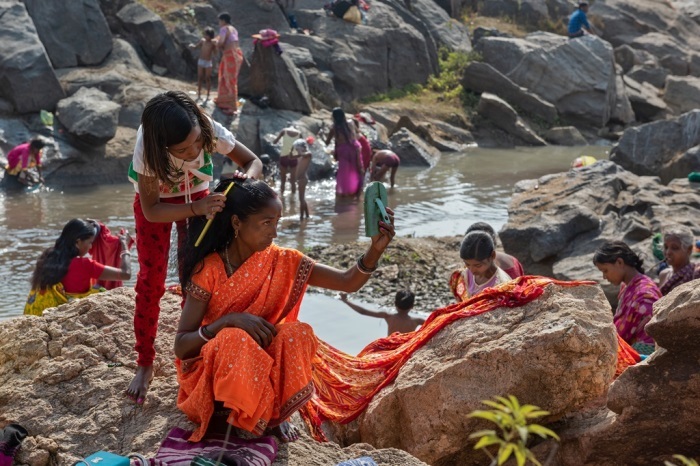 Though government is allocating money for rural water supply and sanitation facilities, many women still bathe in open air in available river water. The situation is more worse during dry hot days of summer. (Purulia, India). 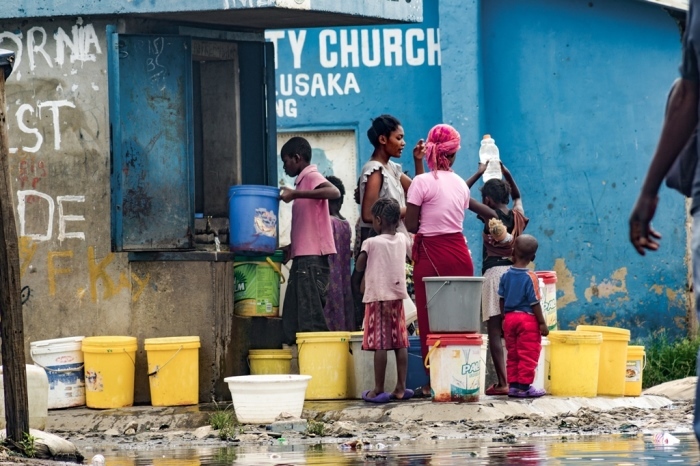 Women and children queue up to purchase water from a tap in a flooded area of Lusaka’s John Laing district. The tap was set up by an NGO in conjunction with the Lusaka Water and Sewerage Company (LWSC) on the initiative of the community. It is managed by the women of the community who receive a commission from the NGO on water sold. Unless a household is able to dig its own borehole and install a water pump, it uses this water. (Lusaka, Zambia). 2018: Where and How Does Money Flow in the Water Sector?